DESCRIPTION: We are drawing different colours and shapes of feathers onto recycled fabric and cutting them all out to create bird wings. 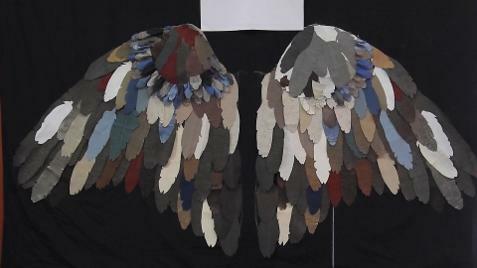 They will be of a suitable size for members of the public to have fun taking photos of themselves with wings on! This project was put together by three women with a passion for creating beautiful objects from textiles and fabric. Georgie Watts, Kelly Bishop and Lee Brache all come from different parts of the world but they are now Broken Hill residents who have found common ground in working together. English – born Georgie finds inspiration through the sensual quality of the materials she uses to produce both utilitarian and artistic objects. Kelly hails from Perth where she worked in library services. She has particularly enjoyed the brainstorming process working as a team and increasing her knowledge of working with textiles. Lee, from Newcastle, specialises in engraving artistic affirmations on mirrors and has a deep passion about designing patterns and templates to achieve beautiful work in fabric. The group would like to acknowledge the generous donation of recycled fabric provided by Robin Harris, of York Barossa.